Welcome! 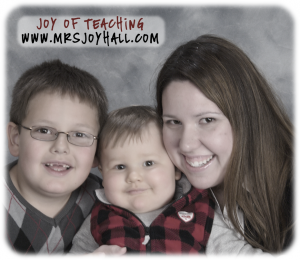 My name is Joy Hall and I have been teaching since 2002. I have a Bachelor of Science degree in special education and a Master of Science degree in elementary reading and literacy. I have recently taken numerous graduate classes on technology integration. I have taught mostly fourth and fifth graders in a resource room setting, however, I did teach for a few months in a preschool special needs classroom, too. I am currently teaching inclusion with just a little bit of pull-out. It sure is a struggle to meet all of my students’ needs with just one structure! In 2008, I published a book, “Coordinate Graphing Hidden Pictures,” through Carson-Dellosa publishing company. You can read more about my experience here. I love math, reading, and art. I find technology to be helpful and fun. I enjoy brainstorming with colleagues and creating my own materials to use with my students. I have written (and been awarded) several grants, including cowriting a Student Achievement grant through the National Education Association with Carey Bonifas. I am married and have two super spectacular little boys. Isn’t my biggest little adorable without his two front teeth? And what about my baby’s kissy little cheeks? I just ADORE those two! I enjoy creating things for them to do to further their love of learning. We especially enjoy playing games! I am always willing to experiment and try new things. I never know when I’ll find something that can make a huge difference! Feel free to contact me at joy@mrsjoyhall.com. Have a great day and don’t forget to make learning fun!